Auutomobile technicians must have current skills and knowledge to keep pace with the ever-changing vehicles. That's why we employ qualified ASE certified technicians. The National Institute for Automotive Service Excellence (ASE) is an independent, non-profit organization that tests and certifies individual automotive repair technicians based on skills, knowledge and experience. I was passing through Pocatello on my way to North Dakota during a 2,000 mile road trip when my radiator began to leak quite badly. Jason was able to fit me in immediately and had my radiator removed, repaired, and replaced that day. They really saved my skin on this one. The staff were knowledgeable, skilled, and professional. We service all makes and models. Four wheel drive vehicles, high performance sports cars, classic cars to your daily driver. All aspects of engine diagnostic, repair, and maintenance. Transmission Diagnostic, repair, and maintenance. 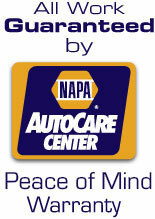 Cooling/Heating Systems, A/C, Brakes, Fuel Systems, Steering & Suspension, and much more. We are a bumper to bumper repair shop, everything but tires and body work!